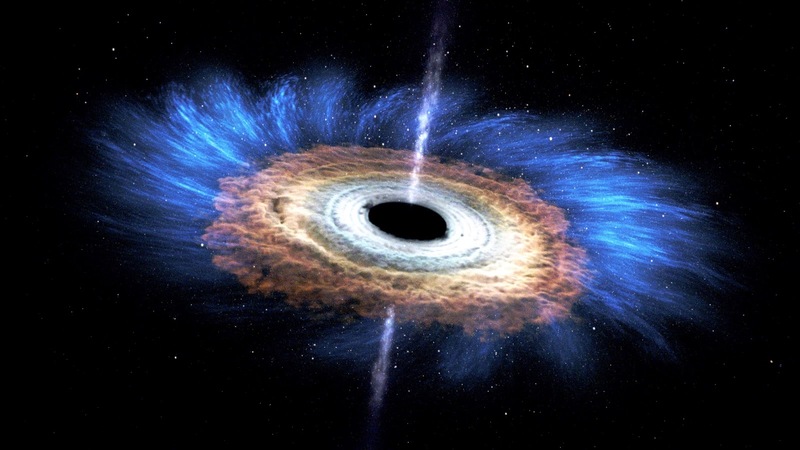 This artist’s rendering shows the tidal disruption event named ASASSN-14li, where a star wandering too close to a 3-million-solar-mass black hole was torn apart. The debris gathered into an accretion disk around the black hole. New data from NASA's Swift satellite show that the initial formation of the disk was shaped by interactions among incoming and outgoing streams of tidal debris. Some 290 million years ago, a star much like the sun wandered too close to the central black hole of its galaxy. Intense tides tore the star apart, which produced an eruption of optical, ultraviolet and X-ray light that first reached Earth in 2014. Now, a team of scientists using observations from NASA's Swift satellite have mapped out how and where these different wavelengths were produced in the event, named ASASSN-14li, as the shattered star's debris circled the black hole. ASASSN-14li was discovered November 22, 2014, in images obtained by the All Sky Automated Survey for SuperNovae (ASASSN), which includes robotic telescopes in Hawaii and Chile. Follow-up observations with Swift's X-ray and Ultraviolet/Optical telescopes began eight days later and continued every few days for the next nine months. The researchers supplemented later Swift observations with optical data from the Las Cumbres Observatory headquartered in Goleta, California. The results show how interactions among the infalling debris could create the observed optical and UV emission.